Quick 5Dimes Sportsbook Review: The closest thing Americans have to Pinnacle, the industry leader when it comes to the best NHL odds. 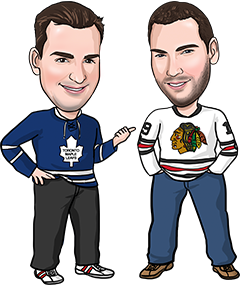 5Dimes offers reduced juice NHL betting lines and also features tons of other hockey betting options and props. 5Dimes is a textbook example of why you should never judge a (sports)book by its cover. There’s nothing exciting about their home page or their interface, both of which look like they were designed in the 1990’s. But if you sign up for a free account at 5Dimes.eu and browse around their website for a bit (you need to be logged in order to see their betting lines), you’ll see they’re actually incredibly efficient and easy to use. There aren’t many hockey bets that you won’t be able to place at 5Dimes. In addition to the standard moneyline, over/under and puck line betting options, 5Dimes also enables you to wager on team totals (at better odds than most books), whether a game will go to overtime or not, or even what the outcome of the first 5, 10 or 15 minutes of the game will be. Did you know? 5Dimes is the only US-friendly NHL betting site that offers reduced juice pricing on all moneylines and totals. It’s not just NHL hockey that you can bet on at 5Dimes, either. On the day we wrote this review, 5Dimes had betting lines up for hockey games in the Canadian Hockey League and NCAA, along with overseas leagues in Austria, Czech Republic, Denmark, England, Finland, Norway, Poland, Russia, Slovakia and Sweden. Let’s see what other reasons there are to bet hockey with them in this 5Dimes sportsbook review. The 5Dimes sportsbook bonus is unique from other NHL betting sites because they actually let you choose which bonus you’d like to have. The reduced juice bonus is the default bonus offered at 5Dimes (if you don’t select a bonus, it’s the one you’ll get), and it’s also the one we recommend you take. If you were to place a few hundred bets in an NHL season at an average wager size of $100, the “5 cents” you’ll save on every wager can save you thousands of dollars per year. 5Dimes has a live chat option through which most of your questions should be answered quickly and easily. If you’re more of the figure-it-out-yourself type, they’ve got a Help Center that addresses questions about how to join 5Dimes, how to deposit or withdrawal, the types of wagers they offer and more. 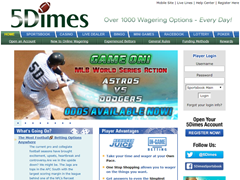 You can also reach 5Dimes 24/7 via email (info@5dimes.com) or telephone (1-800-305-3517). It’s not as flashy as the mobile sites of other sportsbooks, but it loads really quickly and the easy navigation enables you to place a mobile bet in under a minute. There honestly aren’t many reasons not to use 5Dimes, especially if you’re an American. If we have a criticism of 5Dimes, however, it’s that they don’t have that many deposit options, offering just bitcoin and credit cards. Fortunately, those are convenient methods (they’ve got a good credit card processor that helps less credit card deposits get rejected by your bank), but it’s not ideal if you like using iDebit, InstaDebit or some of the other popular options. If you’re from the United States, we can’t recommend 5Dimes enough as the best NHL betting site for you to use. Their reduced juice lines and huge selection of props makes them the #1 hockey sportsbook for Americans.